A week ago, I had some oranges from Rebecca an Mo. People here in Hawaii call this orange as "Ugly Orange" because this doesn't look good. 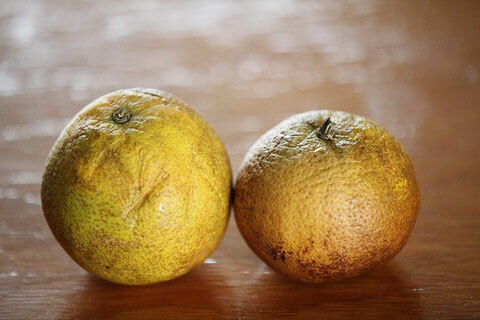 However, ugly orange is generally so juicy and sweet. Therefore we don't mean it's ugly. We recognize it as " Orange that has inner goodness." This is just like saying, "A book shouldn't be judged by its cover." According to interesting the blog I happened to find, there are many sayings talking about virtues of inner beauty and I have enjoyed the following interesting sayings. And the saying I did like was by Confucius (551–479 BC). I think this saying is very close to the idea of Mahayana Buddhism. It's called "Buddha Nature" which everybody has.